Timothy Robert DeKay is an American character actor. His first on screen acting job was as corporate giant Larry Deon on seaQuest 2032. He was a cast member of the series Party of Five from 1997&ndash;1999, Carnivàle from 2003&ndash;2005 and Tell Me You Love Me in 2007. He has also guest-starred on a number of top-rated television series, including Seinfeld, Friends, CSI, My Name Is Earl, NCIS, The New Adventures of Old Christine and Scrubs. DeKay is currently starring in the USA Network series White Collar, which chronicles the partnership between a con artist and an FBI agent . DeKay was born in Ithaca, New York and grew up and attended school in Lansing, a small rural town near Ithaca, NY. DeKay was a school athlete, playing both varsity basketball and baseball. He attended Le Moyne College to study Business and Philosophy. After a short time in baseball, he decided to pursue a career in theater. He returned to Le Moyne in May 2010 in the role of commencement speaker, where he was awarded the degree of Doctor of Humane Letters honoris causa. He attended Rutgers University, where he received an MFA and met his wife, actress Elisa Taylor. He currently lives in California with his wife and their two children. 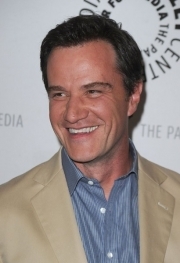 "Mr. DeKay's castmates say it was clear from the start that he was leading man material ... When he graduated with a bachelor's degree in business administration in 1985, he still planned for a career in business or law. It soon became clear, though, that the theater was his true calling. After taking a few courses in directing at Syracuse University, Mr. DeKay headed to Rutgers University, where he earned a master's degree in fine arts. "Now a lifetime member of the Actors Studio, Mr. DeKay has taught as an adjunct professor at the University of Southern California, and appeared on numerous top-rated TV shows." He appeared in two episodes of Seinfeld &mdash; "The Soul Mate" and "The Bizarro Jerry" &mdash; as Elaine's boyfriend Kevin. DeKay was featured in the July 5–18, 2010 issue of TV Guide, which described him as a "hard-working character actor." He stated, "I have a household face but not a household name ... When somebody comes up and says, 'Hey, aren't you the guy from ...' you can sometimes guess which thing they've seen you in. With guys in their forties, it's usually 'Bizarro Jerry' from Seinfeld." The article continues, "Women often know him as Dr. Paul Thomas from Party of Five, and the hipper-than-hip think he's that dude from HBO's Carnivàle or Tell Me You Love Me. But White Collar's changing all that." In addition to his roles in film and television, DeKay's resume includes numerous theatrical credits, with performances in plays both on and off-Broadway. To name a few: Ridiculous Fraud at the McCarter Theatre; Billy Budd at the Circle in the Square Theatre; Someone to Watch Over Me with the Denver Theatre Company; The Merchant of Venice on the Hartford Stage; and the national tour of The Lion in Winter. Whole or part of the information contained in this card come from the Wikipedia article "Tim DeKay", licensed under CC-BY-SA full list of contributors here.